The prefrontal cortex, the part of the frontal lobes lying just behind the forehead, is often referred to as the “CEO of the brain.” This brain region is responsible for cognitive analysis and abstract thought, and the moderation of “correct” behavior in social situations. The prefrontal cortex takes in information from all of the senses and orchestrates thoughts and actions to achieve specific goals. This brain region gives an individual the capacity to exercise “good judgment” when presented with difficult life situations. Brain research indicating that brain development is not complete until near the age of 25, refers specifically to the development of the prefrontal cortex. MRI studies of the brain show that developmental processes tend to occur in the brain in a back to front pattern, explaining why the prefrontal cortex develops last. These studies have also found that teens have less white matter (myelin) in the frontal lobes of their brains when compared to adults, but this amount increases as the teen ages. With more myelin comes the growth of important brain connections, allowing for better flow of information between brain regions. This body of brain research data has led to the idea of “frontalization,” whereby the prefrontal cortex gradually becomes able to oversee and regulate the behavioral responses initiated by the more primitive limbic structures. MRI research has also revealed that during adolescence, white matter increases in the corpus callosum, the bundle of nerve fibers connecting the right and left hemispheres of the brain. This allows for enhanced communication between the hemispheres and enables a full array of analytic and creative strategies to be brought to bear in responding to the complex dilemmas that may arise in a young person’s life. Once again the role of experience is critical in developing the neural connectivity that allows for conscious cognitive control of the emotions and passions of adolescence. Teens who take risks in relatively safe situations exercise the circuitry and develop the skills to “put on the brakes” in more dangerous situations. With an immature prefrontal cortex, even if teens understand that something is dangerous, they may still go ahead and engage in the risky behavior. Recognizing the asynchrony of development of the regions of the brain helps us to see adolescent risk-taking in a whole new light. Walsh D. Why do they act that way? A survival guide to the adolescent brain for you and your teen. New York: Free Press. 2004. Giedd JN. Structural Magnetic Resonance Imaging of the Adolescent Brain. Ann NY Acad Sci 1021:77-85. 2004. ©2013 Cynthia Klein, Bridges 2 Understanding, has been a Certified Parent Educator since 1994. She works with parents and organizations who want more cooperation, mutual respect and understanding between adults and children of all ages. Cynthia presents her expertise through speaking and private parenting coaching sessions. She is a member of the National Speakers Association and writes the Middle School Mom column for the Parenting on the Peninsula magazine. She works with parents of 4 – 25 year-old children. 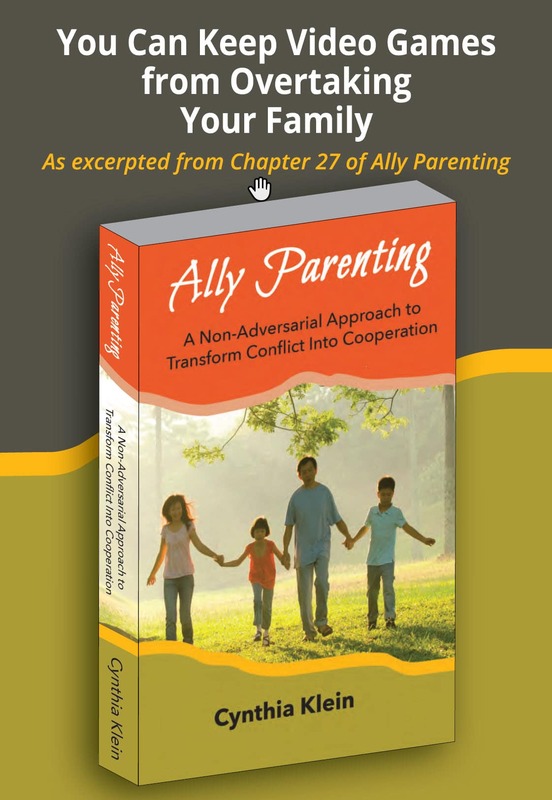 Grab a FREE chapter of the Ally Parenting Book! By clicking submit, I agree to receive emails from Bridges2understanding and understand I can unsubscribe anytime.